18V ONE+™ Defender Chemical Fogger/Mister is rated 3.8 out of 5 by 5. Rated 4 out of 5 by Haan17 from Works ok! Just purchased the fogger, I thought I could use it to fogg my shrubs outside and the lawn. I also wanted to use the fogger like my dad did when he would fog are house for fleas and tick and other insects, but I haven’t try it yet so don’t know if it will work? I think so improvents are needed like detachable tank maybe a turning nozzle to point to the ground or point upward. It’s a good start would like to see improvements. I am going to take it camping and fogg the tents for summer camp I think it will work. Oh one other thing need a power button to stay on by it self! Rated 5 out of 5 by grnguy989 from Great workmanship! I haven't gotten a chance to use it yet because we have three more months of winter but I am looking forward to killin them skeeters!! Definitely well made as always!! Rated 1 out of 5 by gyrfalcon from Not a Fogger This does not create fog. It's a combination of a leaf blower and a chemical sprayer... Get the chemical sprayer instead. Misleading advertising and marketing. This will not vaporize fogging oil and create a fog. Rated 5 out of 5 by Bbickhardt from Very cool machine So much nicer than the propane foggers. Works great. 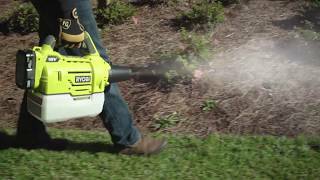 Protect your yard and home with the RYOBI 18V ONE+™ DEFENDER Chemical Fogger/Mister. This versatile fogger delivers powerful results when spraying fungicides, herbicides, insecticides and other treatment solutions. With its lightweight and portable design, you can maneuver and treat any part of your yard with ease. This powerful fogger covers up to 1,000 square feet per minute and 10,000 square feet per battery charge with instant, hassle-free starting. Best of all, the atomized particles travel up to 15 feet in height and settle into those hard to reach spaces for impactful results. 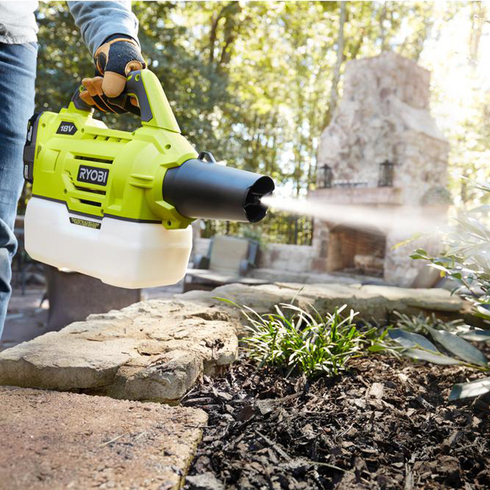 Defend your yard and home from mold, weeds, bugs and so much more with the RYOBI 18V ONE+ Multi-Purpose Fogger.